While I do remember growing up and hearing that crackling burn of the summer campfire, my camping trips had little to do with healthy eating. Our family enjoyed the convenience of processed foods with bags of potato chips and cookies alongside other items that were easy to prepare. The classic marshmallow would also make an appearance. My mindset has changed. I’d like to go camping this summer and there are definitely healthy ways to cook over the open flame that don’t include the high-sugar marshmallow or a slab of processed meat. Here are three healthy campfire foods I’m planning to prepare during a camping adventure up north. Do you know those sticks you usually use for marshmallows? Don’t throw them away. There are healthier uses for them. 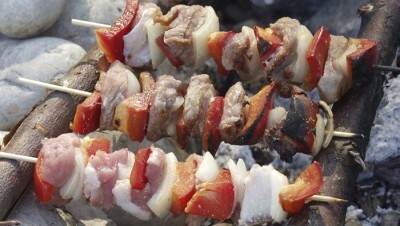 Instead of a wooden skewer, you may want to use a stainless steel skewer. Grills can be set up over your campfire and you can place the skewer on top, or you can try holding the skewer near the campfire, and cooking it similar to your marshmallows, although it will take some time. Thread a variety of vegetables on the skewer—onions, mushrooms, grape tomatoes, zucchini, and red and yellow bell peppers are some of my favorites. The variety provides you beneficial nutrients that a camping trip might commonly lack. I suggest flavoring them with extra virgin olive oil and spices in a bowl to marinate before your camping trip. You could add chicken or beef to the skewer, too. I recommend only using organic and grass-fed chicken or beef without any antibiotics, steroids or hormones. Fish makes for a delicious campfire dinner. You could even catch your dinner while on your trip. If you are bringing your fish, pack them in a cooler full of ice. Some good varieties include salmon, halibut or rainbow trout. Fatty fish are a good way to get some healthy omega fats on your camping trip. Foil-wrap your fish with your choice of ingredients and spices. Extra virgin olive oil, dill, arugula, garlic or onions can be a nice touch. You can put the fish on the campfire grill or cook it on top of the campfire coals. Check your fish frequently to prevent any burning, but it should take you about 20 minutes to cook campfire-style. Marshmallows are the typical campfire snack. But there’s no food value and they’re loaded with sugar. Try grilling some healthy fruit instead. Baking apples or pears on top of the fire are two great options. Another sweet addition would be some all-natural maple syrup which can add some color and help to grill the fruit. To prepare, cut a hole about three quarters through the middle of the apple and spoon out its contents. Stuff the middle with granola and drizzle on some of the natural maple syrup. Wrap each apple in foil and bake for 20 to 25 minutes over the campfire coals. You could also bury them for 30 minutes in the fire’s hot ashes. Another option would be pears and cinnamon. Your patience will be rewarded! From baking fruit to grilling fish or your veggies, there are always healthy options! As you can see it is possible to get out and make the most of that campfire without having all of the processed foods and sugar. Enjoy the woods, the fresh air and eat well. Harlan, J., “Rethinking Campfire Food: 15 Healthy, Easy Ideas + 2 Recipes,” Gaiam life website, July 10, 2013; http://blog.gaiam.com/rethinking-campfire-food-15-healthy-easy-ideas-2-recipes/#.